It’s Free Sauce Friday again!! This time it is brought to you by the fine guys behind Wicked Q BBQ. They have a sweet sauce, a vinegar sauce, Wicked Que rub, and injection powder. And enter a comment on this blog post using “Wicked” in a sentence! That’s it – bonus points for creativity! Barbecue sauces are more to be feared than the wicked! It would make a wicked NFL draft party for this coming weekend if we had some of this sauce and rub for our ribs and brisket. “Ain’t No Rest For The Wicked” when you eating Wicked Q BBQ. When I am good I am good.. But when I am wicked I am even better!.. 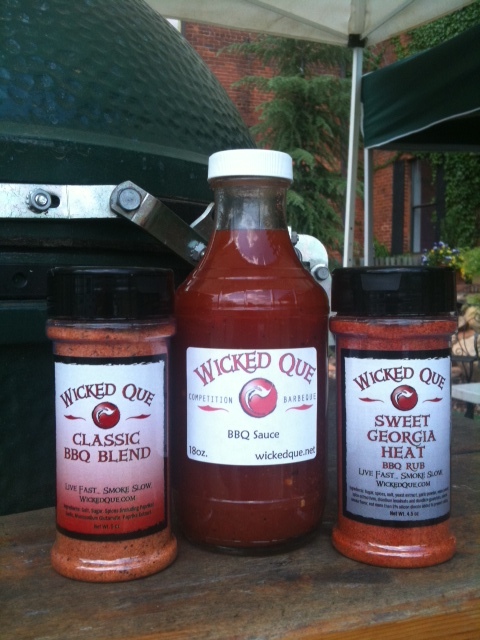 So put Wicked Que on your BBQ today! ^^ me too, had a few too many beers whipping up a wicked bbq rub for friday night grilling. I hope to get Hot, Wicked and Nasty of the Que. It would be wicked awesome if I could finally win some ‘que! Wiked good BBQ is not found when you boil ribs!! Wicked Father, Wicked Mother, Product – Wicked Son !!! I would rather be BBQ’ing with Wicked products than to have my wife drag me to the Broadway show Wicked! Even though I’m a Pastor I would still say wicked BBQ sauce is a good thing. Wicked Que wicked bbq sauce sauce is wicked amazing! Wicked huh? Let’s see ! Normaly Wicked is something bad, but when it comes to sauce it’s something opposite,it must be Wickedly Good! Today is the 100th Anniversary of Fenway Park, this is the site where a “wicked” curveball originated. Hey there! My skilled, sweet, and talented hub! Want some of these ribs cooked with Wicked Que?!?! All the good times we could’ve had. But when I die, Uncle Preston, you better say “Cheers”. Cause when me and you are hanging at the pearly gates, I’ll bring the beers. I’ll bring the beers. I’m ready for some wicked pulled pork with some Wicked Que vinegar sauce. Ya! I GOT SOME WICKED LOOKING RIBS AND CHICKENS LOOKING FOR SOME WICKED SAUCE. Aint nothin’ like enjoyin’ some awesome QUE while watchin’ the WICKED NHL playoffs this weekend…… GO PENS! Winning Wicked BBQ sauce would be wickidy wickid! I make wicked Q for my wicked crue!! You will go hog wild when you use Wicked Que Sauce on wild hogs. Wicked! used as an adjective. The better use would be as a noun or adverb. As in wickedly good, (adverb) or Wicked,(noun). Actually I am sure no one cares – I think that trying the Wicked Que would solve any bbq and or english problem! I made some wicked brisket on the smoker, really, it was the boss! Dumped it in the trash though, when I realized I was out of Wicked Sauce. My ex-mother in-law was wicked, she flew on a broom. I hope your sauce is as wicked good as she was bad. Something “Wicked” this way should come…. so just send me some!!! On a scale from one to two, my number one is Wicked Que!!! Wicked me this wicked me that batman, I bid you adiue as it’s time to use my wicked Que! Something wicked is about to turn this dinner into a feast ! I’d like to try some of the Wicked Q BBQ products. Im going to get Wicked trying this new sauce and rub!!!! !